Although athleisure is undoubtedly becoming a popular fashion trend, more formal sportswear is not as common. 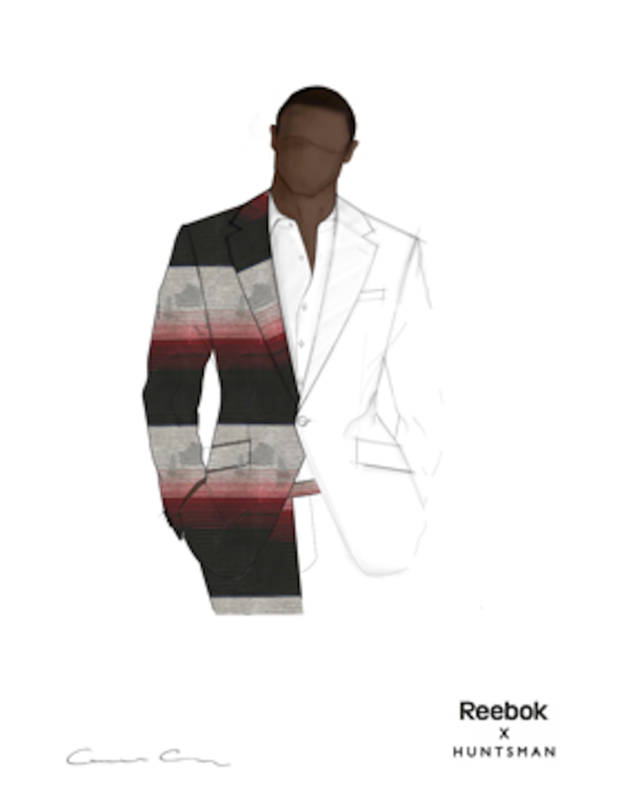 Reebok decided to partner up with renowned tailors Huntsman & Sons to create a distinct suit. Utilizing Reebok’s innovative material Flexweave, the two will work together to create a suit specifically for football player Brandin Cooks. PSFK had an opportunity to ask James Woolard, Brand Director of Reebok Running, some questions about this partnership and what it means for the future of formal wear. 1. How did this partnership happen in the first place? We wanted to put Flexweave to the ultimate test in tailoring and fit—that is one of the virtues of this new textile that is so fascinating. We decided to collaborate with one of the best in the game, Huntsman & Sons, to cut a prototype men’s suit. If it can stand up to the standards of Savile Row, imagine what it could mean for Reebok footwear. 2. What stage of the suit development process are the teams in? At this stage, the Huntsman team have been sent the material and have examined it in their Savile Row house in London. Next week, they are meeting superstar WR and Reebok Running Ambassador Brandin Cooks in Boston to measure him for the bespoke suit before the process really begins. The uniqueness of the material and the musculature of Brandin means that this is completely different to any normal suit creation project for Huntsman, so we’re targeting February 2018 for completion. 3. What is the best part of working with Flexweave and what is it exactly comprised of? Flexweave can, in basic terms, take some of the best bits of knit and traditional sewn cages in footwear to deliver a coveted fusion of durability, lightness, fit and performance. The open figure-8 construction of Reebok Flexweave can interlock unlimited strands of fibers to create a single surface construction, providing improved fit and performance through specialized tailored zones. Huntsman will be working with the first generation of Flexweave material, which is comprised of chenille yarn. 4. How does this suit differ from others out in the market? The suit will be completely tailored from Flexweave material; never before has a material created for shoes been used to create something as unique as this. Huntsman & Sons have created suits from a wide range of materials but never from the upper part of a shoe. 5. Are there any other future collaboration plans for Reebok and Huntsman? We’re fully focused on this exciting partnership first and then we’ll consider future collaborations. It is a very exciting period for the brand!